Beginning in 1954, the Sisters of Notre Dame set the standard in Northeast Ohio for providing the highest level of education and care for children, grades K-8, with special learning and social needs. This tradition continues today as Julie Billiart Schools. With one campus in Lyndhurst and another in Akron, we are empowering students with special needs to believe that anything is possible. Creating an atmosphere of acceptance in the classroom, recognizing students’ unique gifts and talents, and collaborating with our students’ families to reach goals is just a part of the culture at Julie Billiart Schools. The “JB Way” is who we are, what we do and how we do it. It's the combined qualities, characteristics, and attributes, demonstrated by St. Julie Billiart herself, that set us apart from other public and private schools. It’s our core, our strength, and our reminder of how ALL children have the potential to be happy, successful students. 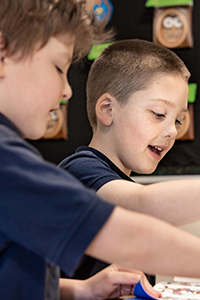 Our students are bright, creative, and curious children coming from 42 school districts located throughout Cuyahoga, Geauga, Lake, Lorain, Medina, Portage, Summit, and Wayne Counties. Every child learns differently and because of that our certified intervention specialists collaborate with onsite therapists to assess and develop strategies that are tailored to each child’s learning style. Our team approach to whole-child learning combines the benefits of occupational, speech, art and music therapies with academics and social skill development. Because continuity is critical to a child’s academic success, our team of special education experts also work closely with our students' families to ensure they have the skills and knowledge needed for at-home-learning. Religion: 40% Catholic: 60% other, including those that attend Jewish, Methodist, Lutheran, Presbyterian and non-denominational places of worship. Ethnicity: Our diverse student body is comprised of many ethnic cultures including African American, Asian, Caucasian, Hispanic, Multiracial and Native American. Financial Assistance: 100% of our students receive full or partial financial support through the Autism or Jon Peterson Scholarship Programs or financial aid through Julie Billiart Schools. Our aim is to serve students that would most benefit from our academic and social programs, regardless of their ability to pay. Types of Diagnoses Served: Our educational model is designed to best meet the academic and social needs of children with learning challenges and those that have been diagnosed with high functioning autism, dyslexia, dyscalculia, dysgraphia, ADD/ ADHD, expressive language delays, receptive language delays, written expression difficulties, anxiety disorders, and executive function deficits. Small class sizes; up to 12 students in grades K-2 with a maximum of 16 students in grades 3-8. High teacher-to-student ratio; 1:6 (K-2) and 1:8 (3-8). Each grade level utilizes one classroom for group instruction and a separate, smaller space for when students need more individualized attention. All classrooms provide interactive display board technology and students are equipped with Chromebooks for instruction and homework purposes. To nurture and empower students with special learning needs. As Catholic K-8 schools rooted in the educational principles of the Sisters of Notre Dame, we welcome diverse faith traditions. Julie Billiart Schools strive to build self-confidence, inspire Christian values and empower students with skills, knowledge, and enthusiasm for life-long learning. Julie Billiart Schools serve students with unique learning and social needs including ADD/ADHD, dyslexia, high functioning autism, and other differences.